UpSpring offers a combination of group classes and private lessons for adults of all levels. All classes are taught at Joe’s Movement Emporium in Mt. Rainier, MD. Most classes are open to ages 16 and up. Please note that UpSpring does not currently offer children’s classes. If you are looking for children’s aerial or circus classes, email us at upspringstudio@gmail.com for a referral. Our general class offerings are listed below. Please go to upspringstudio.acuityscheduling.com to register or view pricing and packages. Most classes are $25-35. Private lessons range from $50-120 depending on the number of students. Note: Students should register by midnight the day before class. Please read our information page prior to registering. For most group classes, you must register at least 12 hours in advance. For private lessons, you must register at least one week in advance. If your preferred class is not available, email upspringstudio@gmail.com. We might be able to fit you in! Prior to registering, please read our important information for students at upspringstudio.com/info. PLEASE BE SURE YOU ARE REGISTERING FOR THE CORRECT CLASS. WE DO NOT OFFER REFUNDS. In some cases, we can reschedule you if you give us 48 hours notice. We can reschedule you within the same session ONLY. We cannot reschedule you to future or past sessions. Multi-class passes are available for some classes. Students who purchase a class package will receive a code that they then use to register for specific class dates. 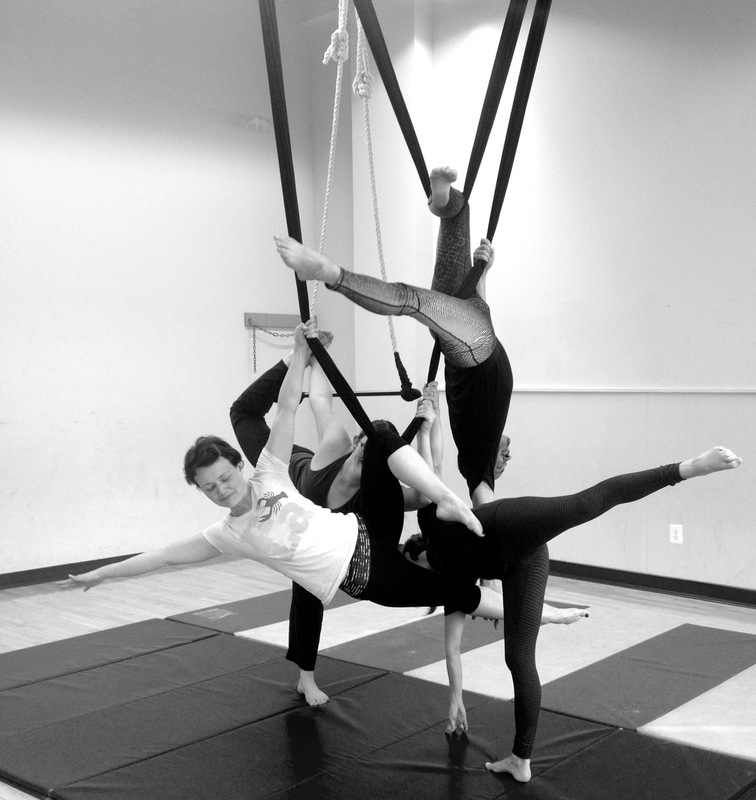 Aerial Grab Bag is a drop-in, experimental aerial class for intermediate and advanced students. In this class, we will use improvisation techniques to explore and create new work on known and invented apparatus. This class is for students who have approximately one year or more of consistent aerial training. Students should be comfortable working independently in the air and have some experience with aerial improvisation. Ages 18+. Open hangs are extra practice times for current UpSpring students who have attended lessons at UpSpring at least 3 times per month for the past 6 months. One trapeze, fabric, or hammock will be provided; however, students may have to share equipment if two students wish to use the same equipment. (There is no guarantee that a specific type of fabric or trapeze will be available. Private and group lessons have first pick of equipment.) Students may use their own equipment provided that equipment has been inspected by UpSpring. Open hangs may be rescheduled but are not refundable. If the day/time you want is not available, contact upspringstudio@gmail.com. We may be able to accommodate you.